Every month I hold a tasting for my wine club members. 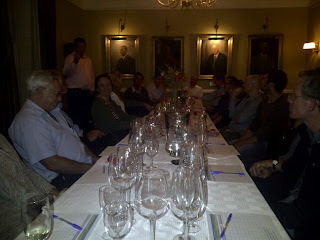 If you would like to become a member please email me on westerncapewineries@gmail.com. The February blind tasting was a Chenin Blanc tasting. I sourced ten Chenin Blancs from the Western Cape for us to try on the night. 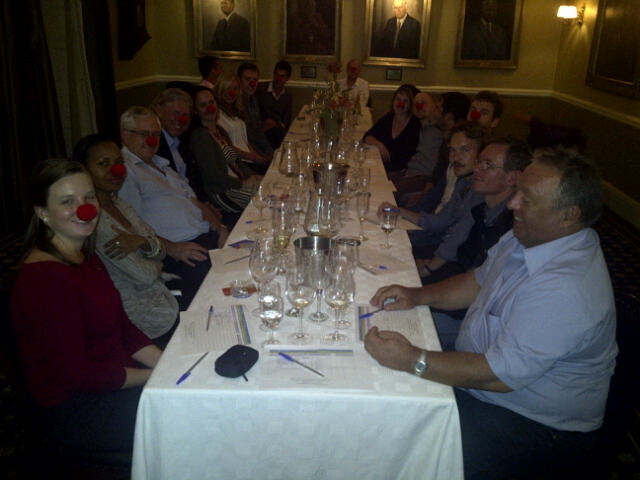 That evening the wine club members helped with supporting RedNose CharityEvents by buying a nose each. The money raised that evening went towards buying food for children. 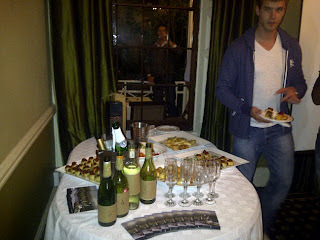 The evening started with canapes, Laborie MCC and Overhex sparkling on arrival. Jandre Human from Overhex told us about his wine estate and wine. He informed us about the characteristics of Chenin Blanc and what we can expect on the nose and palate. We tried the wine in two's. We tried #1 and #2 first, then #3 and #4 and then #5 and #6. We then had canapes at half time before sitting down to the last 4 wines. We tried #7 and #8 and then finished with #9 and #10. After taking the votes on which wine was liked on the evening, it was apparent that #5, #9 and #10 were the favourites. They were only one vote from each other!! We then tried #5, #9 and # 10 again side by side to see if it would make a difference in the votes but it didn't, it was still extremely close and with the same results. #5 won: Chenin Blanc from Cederberg Wine Estate. Was very fruity and just delicious!! #10 got second: Chenin Blanc from Zevenwacht. A little wooded. #9 got third: The Big Easy (Chenin Blanc) from Ernie Els. Pleasant, easy drinking. It was yet another lovely evening. The next wine club evening is on the 9th of April. Etienne Louw from Altydgedacht will be introducing us to his wine. The event will be held at the Five Flies. Tickets are R120 per person which includes canapes, arrival drink and the wine tasting. Please contact me if you would like to join. Today I decided to visit Ernie Els and see what the fuss is all about. From the moment I reached the entrance, drove up the driveway, got out of my car, walked along the path to the tasting room, I was intrigued and drawn in. I couldn't wait to see more! The tasting room had an impressive grandness about it. Several ladies were working even though it was a Monday. Turns out they have tours and visitors coming throughout the day and therefore need the staff even on weekdays. A tasting of all 8 wines costs R60 and a tasting of 4 wines was R30. I decided to go for the whole tasting in case I picked the wrong wines and missed a good wine. I was told I could sit anywhere I liked, so I decided to find a nice place outside with a view. We started off with the Big Easy Chenin Blanc 2012 at R65 a bottle. It had a nice aroma with notes of apples and pineapple. This wine is a little complex, is soft on the palate, has a slight acidic taste, with an apple, pear and lemon taste. It didn't seem balanced. The Sauvignon Blanc 2012 at R80 a bottle has a sharp fruity taste full of fig, pineapple, lime and lemon. It is soft on the palate yet has acidic fruit flavours and a lingering fresh finish. The Big Easy 2011 at R120 a bottle is a blend of Shiraz/Cabernet Sauvignon/Grenache/Cinsault/Mouvedre/Viognier. It was a little dry, has a little sharp finish to it, it was ok. Merlot 2011 at R140 a bottle had good (medium) body, was soft, a little dry/chalky, I liked it. Cabernet Sauvignon 2011 at R150 a bottle had a lovely aroma of tobacco, dark berries and spices. This wine was a little dry also, had good flavour though, was light yet had a nice round mouth feel. The Proprietors Syrah 2011 at R210 a bottle was very nice. It had a lovely aroma which was a little spicy, lovely feeling on the palate, it was light, soft and spicy. The Proprietors Blend 2010 at R210 a bottle was also very nice! Strangely it had a grassy nose at first, which had earthy tones also. It was lovely on the palate, has a little dry aftertaste, seemed slightly acidic, had a fresh feeling to it/almost mineral. It was light, and had a light fruity taste. It seemed like they had made a natural wine which represented the terroir on the farm. It was nicely balanced. I actually found it a little complex in that I couldn't get my head around this wine. I loved it though!! The Ernie Els Signature 2010 at R550 a bottle was also a favourite of mine. It had a gorgeous fruity and chocolate aroma. It smelt yum! It was very smooth with a dry aftertaste. It was a bold wine. I liked this wine. I have to say, I thoroughly enjoyed my tasting here. The lady who served me was named Chane De Jager. She was passionate about the wine and knowledgable. I was really impressed with the experience that she created. The package is there at Ernie Els. It will be interesting to see if they end up with a restaurant that can cater for the masses that rock up here. With such a view I think it's a must!! If you do a day trip in Heldeberg I think it is worth while visiting this winery. However, if you don't want to try the entire range, then I suggest trying the three most expensive wines and then choosing one other to make 4 wines. If you just have one day to visit wineries while in Cape Town then I highly recommend spending that day in the Helderberg wine region. 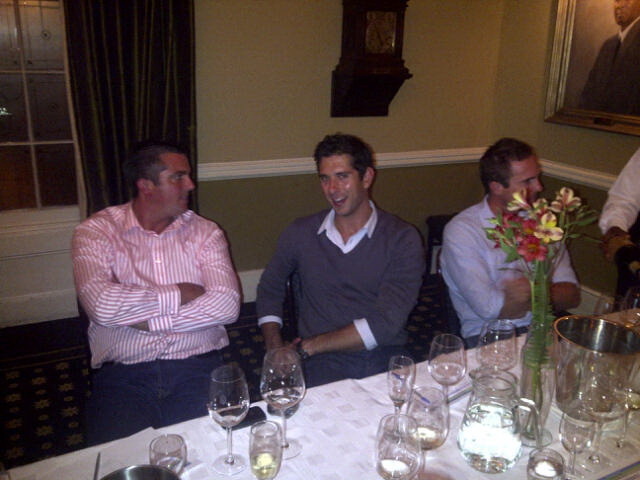 I would suggest Haskell Vineyards, Rust en Vrede, Hidden Valley and Ernie Els. The views are amazing at these wineries, the wine is superb and the service is usually of a high standard.